With the third volume of Prophet published, it’s much easier to see the structure of the series. It’s uncanny just how sneaky the narrative has been since issue #21, the first issue of the reboot. 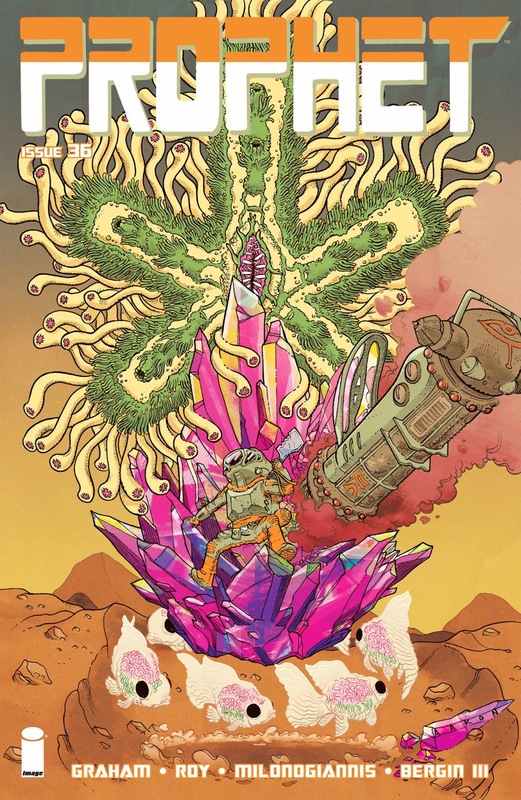 Labelled as part of the Image Revival, Prophet was rebooted by Brandon Graham at the helm and aided by a host of collaborators. Throughout the series they’ve all rotated on art duties and Brandon Graham, Simon Roy and Giannis Milonogiannis are credited with the story. Graham takes care of most of the scripting and he’s also taken on the duty of layout artist (something the other artists also contributed to during the earlier issues but timing and deadlines made them assign a specific person). It adds some nice consistency to the art, pacing and storytelling. I’ve come to really enjoy the creative team on this book. 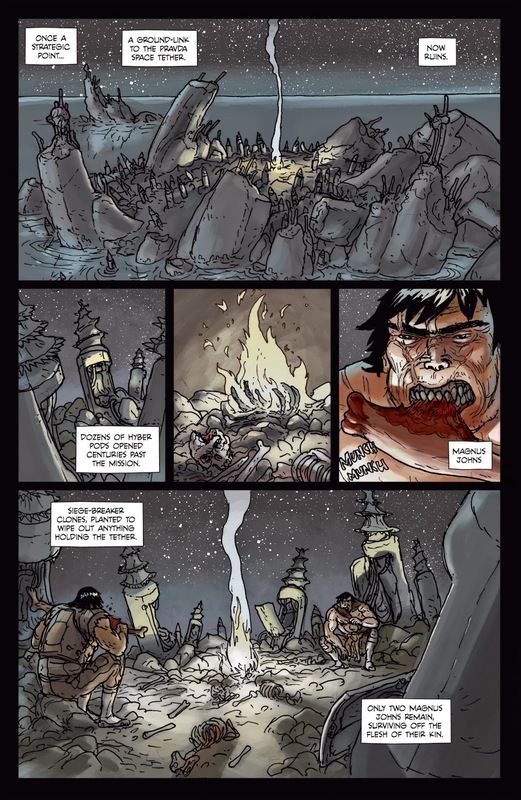 Roy and Milonogiannis do the bulk of the artwork but they’re aided by a host of other artists, likely inkers as Roy and Milonogiannis are also credited as colourists. The different art styles mesh together well, all complimenting each other but also adding further variety to the strange worlds and aliens being created as issues drawn by Simon Roy look different from those by Giannis Milonogiannis. I’m convinced that if the whole things was the product of a single artist many of the creatures would look similar and thus make the whole comic look less creative and original. It’s important not to understate the work of the artists on this series because it’s clearly one of the reasons the series is so great. In volumes 1 and 2 most of the story was told through narration boxes and images. There isn’t a lot of dialogue and it gives the story a certain distance, strengthening the idea that the events are taking place far in the future. It’s so strange that the reader is forced to participate in the story as the actions require interpretation by the reader; it requires we puzzle together the short, almost sound bites style narration and the dazzling depictions of future worlds in order to see the story fully realized. This is the best kind of comic. It uses the medium to do something it’s good at, which is engaging the reader in a participatory relationship with the comic. In a world where most comics are about superheroes that inhabit worlds very similar to our own, it's very refreshing to read a comic where everything is varying digress of odd. The worlds and aliens imagined by Graham and his collaborators (nearly everybody contributes to the story) are so unusual I can helped but be thrilled, curious, weirded out and pensive all at the same time. The choice of having little dialogue and telling the story mostly through images and short narration boxes makes the story feel more emotional. The thinking part of my brain is being used, but my thoughts aren't being stimulated by dialogue. Instead the story connects with me in a more loosely defined way, though my emotions. Those emotions mixed with the images of what’s happening on the page make me think about what I’m reading. It’s emotional stimulus brought on by visual aids. The third volume of the rebooted Prophet has more dialogue than the previous collections. I think that part of it is due to the fact that the setup, all of the establishing issues, are done. The pieces are all set and the story is advancing at a quicker pace than it has before. It’s both refreshing and exciting! That’s not to say Prophet has become a dialogue heavy comic because it hasn’t. Characters still talk in small, punchy speech bubbles and there are nearly silent pages in every issue but Prophet: Empire is definitively the indication that the series has entered a new phase. The first volume established the setting, the tone and a handful of characters. 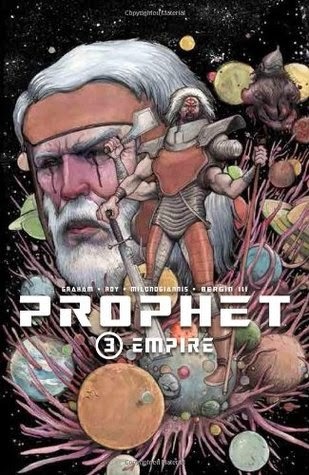 The second volume focused on Old Man Prophet and his mission to reform his team and search for new allies. As the title suggests, the third volume brings the focus back to the Empire and its growing army of Prophets. In more than one way, this volume is about both stories coming together. The first Prophet we met in issue #21 is now known as New Father John, one of the Prophets’ leaders. They are not the only leaders though; the Brain Mothers and the Brain Father control the Empire with their telekinetic powers. All young Prophets are trained and brainwashed to obey their Brain Mothers, regardless of their instructions. Old Man Prophet wears protective gear to prevent his former masters to gain control of his mind. He has his own telekinetic ally, a being known only as Troll. There are some very exciting developments between Old Man Prophet, Troll and New Father John. Other things take place in volume 3 that are also very exciting, such as the addition of yet another threat to this new war. This volume is about both storylines coming together and the creative team delivers that story in a way I hadn’t anticipated. Prophet: Empire gives the reader a little bit of everything. It establishes even more new elements to the series, provides further information regarding the Empire along with Old Man Prophet and his allies. The most exciting of all is that it pits New Father John and Old Man Prophet are on a collision course. It's going to be pretty sweet when they meet up. I’ve read a few reviews of Prophet online and it appears to be a very divisive series. People who enjoyed it really enjoyed it but those who didn’t seem to loathe the “weird art” or think that the comic “doesn’t make any kind of sense”. One reviewer even dismisses the book after admitting he didn’t even read half of this collection. Did he read the first two volumes? I have no idea but it’s clear to me that he didn’t enjoy having to put any effort in his reading. He went so far as to dismiss the series as “nonsense”. What I like about Prophet is that it challenges me. Readers who didn’t enjoy it critique it for the same reason I love it. Prophet doesn’t spoon feed the reader. What it does is provide the reader with a rich and complex story that can withstand, I would even say encourages, multiple readings. What you get out of Prophet is proportional to what you invest in it and I see nothing wrong with that. That’s especially true when the series continues to be a refreshing combination of originality, engaging storytelling and captivating artwork.